Avalokiteshvara is the embodiment of compassion of all the Buddhas. In the Theravada tradition, Loving Kindness is translated as Metta and Compassion is Karuna. “Metta” is the wish for all sentient beings to be full of happiness and causes of happiness while “Karuna” is the wish for all sentient beings to be without suffering and without causes of suffering. These principles are very important in Buddhism as they are part of the 4 Immeasurables. Avalokiteshvara is also known as Chenrezig in Tibetan or Kuan Yin in Chinese. It is spoken in the tantras and explained by Guru Rinpoche himself that just by calling his name and making a connection with him in any way, let alone by chanting the Avokiteshvara Mantra and doing the practice, all six classes of beings can be liberated from the six realms of samsara (hell, hungry ghost, animal, human, demi-god, and god realms), and all the sufferings contained therein, for example, birth, old age, sickness and death. The practice of Medicine Buddha, the Supreme Healer, is an extremely powerful method for healing physical illnesses, both for oneself and others, and also for overcoming the inner illnesses of attachment, hatred, and ignorance. Therefore, meditating on Medicine Buddha can help decrease physical and mental illness and suffering. The Medicine Buddha mantra is held to be extremely powerful for the healing of physical illnesses and purification of negative karma. It is said that just by hearing the mantra once, one will not be reborn in the three lower realms, so making a connection with Medicine Buddha, however small, has enormous benefits. The world is getting increasingly volatile with apparently more human suffering caused by increasing frequency of natural disasters or human acts of violence than other times in recent memory. The objective of this talk by Rinpoche is to teach us how as human beings, we can make ourselves and our world better through a better understanding of nature of things. Here Rinpoche will give advice from the Buddha’s teachings on how to tame our minds and negative emotions and implement the Buddha’s teachings so that we can live peacefully, happily, and harmoniously, regardless of what happens in the external world. There are five main classifications of negative emotions according to Buddhist teachings, anger, greed, ignorance, pride and jealousy. Rinpoche will teach us methods to recognize these emotions in ourselves and methods to dispel them. To recognize negative emotion is very important for all levels of practitioners. Reduction of negative emotions can often indicate the positive progress of the practice. Before the Buddha achieved full enlightenment , he was a Bodhisattva. Bodhisattva practices are the perfection of the six paramitas, especially the paramita of wisdom, with the foundation being the Bodhicitta. The Bodhisattva path includes the qualities to be able to actively benefit all sentient beings without any hesitation or fear. Rinpoche will explain the benefits of living the Bodhisattva path, and the essential characteristics of of a Bodhisattva. The five basic qualities of Bodhicitta are: Clarity, Calmness, Focus, Wisdom and Compassion. Bodhicitta is a perquisite to Enlightenment. Enlightenment will free us from the samara of birth, old age, sickness, death, and endless re-birth. 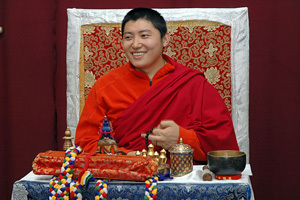 Rinpoche will teach us what Bodhicitta is, and how to develop it gradually in our daily lives. This is a collection of very previous texts from the Tengyur (the Collected Translated Treatises) composed by great, realized masters from India, such as Vimalamitra, Kamalashila, and Singhabhadra. The texts teach the view, meditation, conduct, and fruition clearly and precisely. These texts are adorned with many quotations from the Buddha’s sutras which Rinpoche will share with us. These teachings from the Great Indian Masters are very useful for the development of one’s meditation practices. We are happy to announce an audience with Ajahn Jayasaro on Tuesday November 2nd, at the Tavana Hotel, in English. Ajahn Jayasaro was formerly the co-abbot and then sole abbot of Wat Pah Nanachat International Forest monastery in the North-East of Thailand for many years. Wat Pah Nanachat is in the lineage of Luang Phor Chah – a huge name in Thai Buddhism. 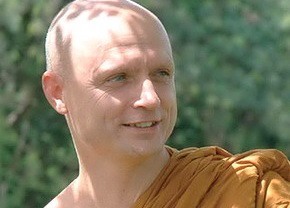 Ajahn Jayasaro now resides alone in Kao Yai, and rarely makes public appearances in English outside of his hermitage. Ajahn Jayasaro is well known for his interesting and moving Dhamma Talks, in both his native English and also in Thai. For many years he led the International monastery and gained a fine reputation for accessibility and sharp dhamma. Hugely popular with the Thai community we are very glad he will talk this time in English only in support of the international community here in Bangkok. Ajahn Jayasaro describes Buddhism as an ‘Education System’ rather than a ‘belief system’. This is because it is not founded on a dogma, but a practical series of tools to be applied by the individual, for the sake of growth, change, and re-educating ourselves. It is also a passion of his to introduce to schools some of the ideas of mind training so that youth learn some practical self management skills in the realm of the mind, rather than just academic topics. There is no charge and no need for advance registration – just turn up. The event is kindly hosted free of charge by the very beautiful Tawana HotelDhamma project, led by Tahn Chao Khun Bunma. 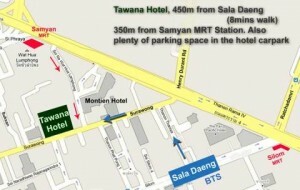 Tawana Hotel, 80 Suriwongse Road, Bangkok 10500. Sala Daeng BTS station is a 7-8 min. walk, and Samyan MRT is 4-5 minutes walk away. There is plenty of free parking in the hotel, accessible from the front on Suriwongse Road. 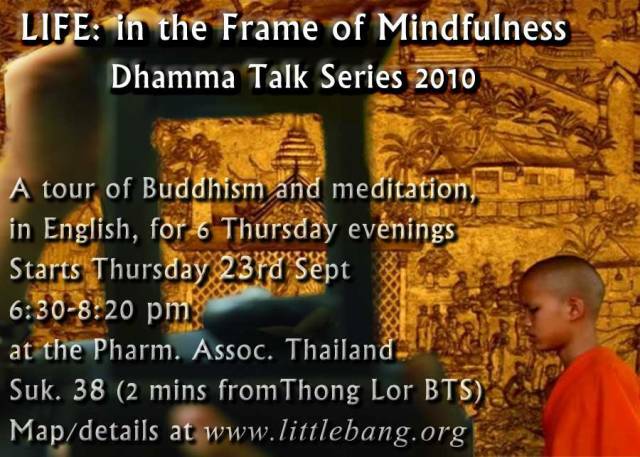 For more information please visit the The Little Bangkok Sangha site. การบรรยายจะเริ่มวันที่ 23 กันยายน 2553 โดยจะมีทั้งหมด 6 ครั้งในทุกๆวันพฤหัสบดี เวลา 18:30น.-20:30น. The 41 years old Phra Pandit Bhikkhu is a British monk, living in Bangkok, who has been ordained for 14 years in Thailand.